We, and almost 100 of our neighbors, spent an afternoon chowing down on wild boar and a few dozen other delectable dishes. This was a potluck extraordinaire, done in true potLUCK style. The featured attraction was wild boar killed locally last week by a couple of our neighbors. Some Southern boys cooked it and the hosts were kind enough to invite our street and the several adjacent ones, as well. Result? The biggest street party we’ve ever seen. The adherence to potluck values produced a fantastic variety of food. We had wild boar, great pork chops, eight or ten kinds of potatoes, lots of beans, several salads, and more desserts than we could eat. 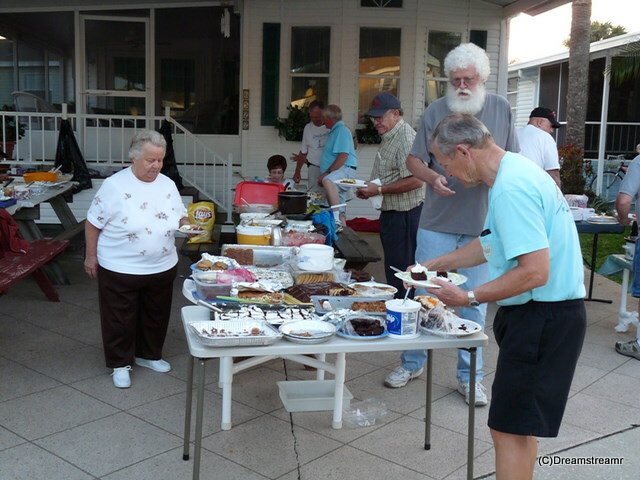 This was a fantastic potluck and a nice time to get everybody outside. 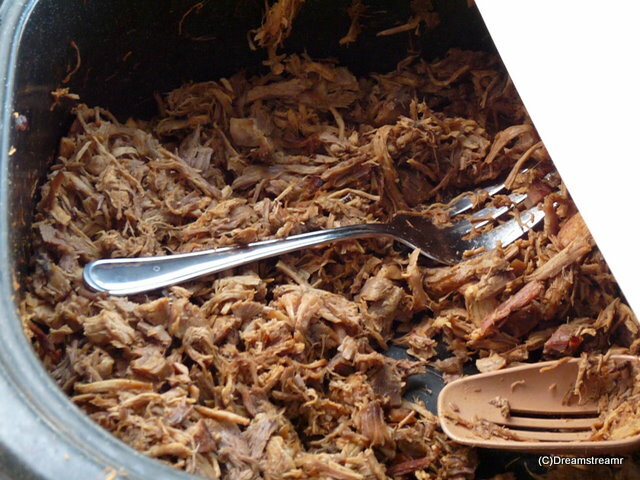 How was the bbq’d boar? Almost as good as BBQ from Lexington, NC! Today we spent a day at the beach. The morning was for a shopping mall experience, something we cannot do in Okeechobee. Locally we have stores for the necessities, like groceries, hardware, building supplies, and some clothing places. Oh, and a LOT of fishing tackle. What else could we want? You cannot buy bicycle parts locally. Except for Wal-Mart, you cannot buy tennis balls locally. And there isn’t much shopping for granddaughter birthday presents. So we had fun doing what we so rarely need do, spending a few hours at a big mall. 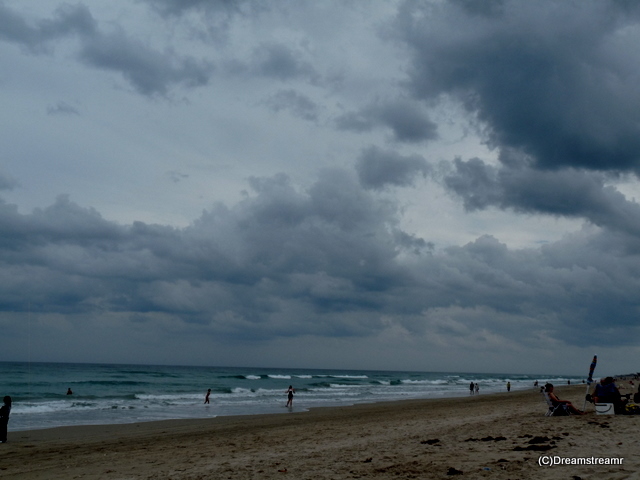 Our reward was the afternoon at Jensen Beach on Florida’s Atlantic Coast. Weather was nice but not very solar. Breezes were light, cloud cover was thorough, and the temperature was just below 80F. We were warm without getting hot, and enjoyed reading, watching and listening to the surf, and relaxing with sand between our toes. A gray day at the beach is better than a good day anywhere else. We loved having a day out. 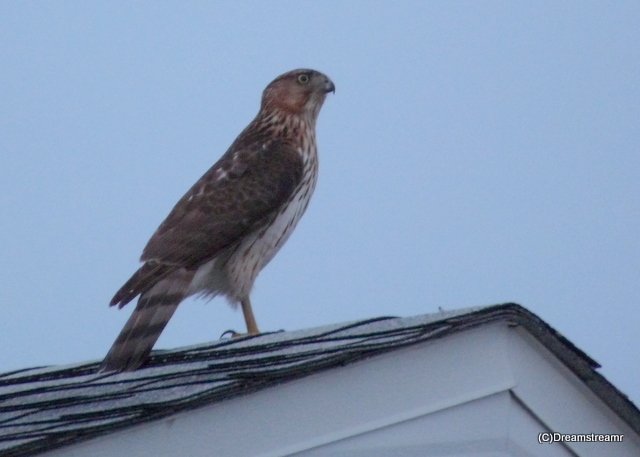 And, upon our return we find our silver home has been under the very watchful eye of this hawk. Even with his back to our home, he had his sharp eyes on everything. Our life, living in a home one-half the size of their carports, is not well understood by our families. Our home is less than 200 square feet. We don’t have a garage, a basement, or an attic. Folks in big houses might not really notice the trappings of big spaces with hiding places above, below, beside, and inside. How much time do you spend straightening the garage? Frank Lloyd Wright eschewed garages in many of his house designs. Wright preferred carports because they would avoid the capture of all that clutter. You know, once it gets away from you, the garage just can’t be recovered. You’ve avoided going up to straighten the attic how many times? It’s too cold, it’s too hot, you have four gazillion things more important to do, you aren’t missing anything up there, and visitors almost never see it anyway. What’s really in the back of the big downstairs coat closet? You know, the mysterious and unknown territory under the coats, and the tablecloths on those heavy-duty hangers, behind the vacuum cleaner and the boots? Who will ever know until you are forced to search even this hidden place? In many markets across the United States housing was a sure investment. In some U.S. markets this might still be true, although odds makers probably would offer less than certain odds on it. A house is to have and to hold and to maintain and to clean and to keep organized and to repair and what else? It’s a lot of work, isn’t a certain investment, and might not be all it’s cooked up to be. We didn’t even get around to mentioning the most obvious — we can, and do, move our house about the states and provinces of North America. And we’re loving doing this in our 25′ Airstream travel trailer. Do we really need this techie stuff? One of our readers (a newbie Airstreamer) asked a few interesting questions of us this week. We thought the answers might interest others too, and maybe even generate a comment or two. So (with their permission) we’re putting the questions and answers in this blog. Do we need to buy and use a SURGE PROTECTOR? o Need/don’t need? We aren’t considering the outlet strip “surge protectors” you can buy at office supply stores. We’re talking about the heavy duty transformers with sophisticated electronics to handle your RV’s 30amp or 50amp power and smooth out the high and low voltage excursions. We do NOT use this. You must make your own decision here. Most parks have pretty good power, only one park in the past couple of years had power that varied a lot. But you can over-protect on one thing and never know what will get you. Electrical surge protection seems to be one of those “insurance” things. Some people swear by it but majority of people we encounter don’t seem to need it. o Any recommended ones? We cannot recommend one, never used one, never plan to. Every month or two we’ll stay in a park which prohibits the use of the large surge suppressors. We do have a couple of friends who are readers of our blog, both are super smart engineers who airstream. We’ll ask them, and we welcome any readers comments on this issue. The next question is, Do we need a VOLT METER? o Need/don’t need? Yes, you need this in at least two different versions plus one variant. It is important to check, at least initially and then periodically, the 120 v.a.c. level in your trailer while in a campground. If the indicated voltage varies more than 10 percent plus or minus from the 120 volts, then we unplug from park power and run on batteries only. How do you know the park’s electrical power isn’t reasonably steady if you don’t periodically check a volt meter? More on this below. We also have a small twelve volt meter to indicate battery voltage. This one plugs into one of the RV’s 12vdc accessory outlets and digitally displays voltage to nearest 1/10 volt (e.g., 12.3, or 13.8). It also has green, yellow, red light to indicate the range of voltage at a glance. Jim likes to fret about our battery voltage after a day of dry-camping, and the 12vdc meter helps. Jim can watch the battery creep down, gradually, from 12.6 to 12.2 and below. Makes him really nervous and want to get the candles out. We learned though, while spending ten days dry camping in cold weather in Ketchum, Idaho, the batteries will do just fine overnight even from 12.2 at bedtime. The furnace ran a couple of times and the batteries pulled it just fine. In the morning we were still at 12.2vdc. This is real handy — not the end-all but nice to have. But, most important of all is the IDEAL-Sperry 61-500 (or equivalent) polarity tester. You must use this when you connect park power to your trailer before either of you contact the trailer’s metal parts. This little polarity tester tells if the park’s power is wired properly. Electrical wiring hazards in your RV (and in your home) can include absent connection to “ground”, or the hot and neutral wires may be reversed, or the connection to neutral may be open. Any of these hazards can be a shock hazard danger to you and a physical hazard to your trailer’s electronics. These little polarity testers cost between $8 and $15. o Any recommended ones? We use a square tan jobbie for monitoring 120vdc. It plugs straight into any wall outlet, has approx a 2″ X 2″ clear view window. It has absolutely no brand marking on it whatsover. We purchased it from Camping World five years ago for a little less than $20, I think. o Or criteria to look for in one? The 120 vac meter is an analog meter, has green and red display area to indicate acceptable (green) and bad (red) voltage conditions. This is so simple and is hard to beat. For 12 vdc, one alternative is an electronic smart meter to read multiple battery aspects and perhaps keep some info in memory. We haven’t gone this route yet and don’t know if we will. It isn’t anything we’ve needed. Some solar charging systems include pretty neat metering capability and we might find our way to one of these meters someday. The last question for today is, What about a WATER PRESSURE REGULATOR for the trailer? o Need/don’t need? We haven’t seen any reason to add a second pressure regulator for our trailer. Your Airstream has a water pressure regulator built in, at the potable water inlet, recessed into the trailer’s exterior wall. Ours has not given a minute’s trouble in four years. Some people wear suspenders and belt. Some people contend (and some parks suggest) it is important to place a pressure regulator between the park’s hydrant and the RV’s water hose, to protect the water hose from the park’s extremely high pressure. Jim worked in a large RV campground in Kissimmee, Florida, almost forty years ago. Folks would spend all day at Disney World or Sea Land or wherever. When they returned they would find their water hose had burst from the sunlight softening the vinyl water hose and also creating high pressure. That park recommended folks turn off their campsite water hydrant when they left for the day. Sometimes we still turn ours off for the day, but usually we leave it on. Two summers ago we were staying a very very hot week in Bakersfield, California. Spent days visiting a dear friend in the hospital. Returned late afternoon to find the hose had melted down completely. Oh, it wasn’t the water hose, it was the other hose — you know, the big one. Yeah, it was a big one alright. We always always leave our black drain valve closed when not dumping (and very rarely leave the grey one open but sometimes forget because we walk away while it takes its five minutes to empty). Our sewer hose was empty and dry, and the direct sunlight and 106F degrees air temperature was just too much for the vinyl on a very good quality hose. Camping World very readily replaced it with a free one, same hose. We’ve used it over 18 months since without incident. Who knows just what happened that hot August day in Bakersfield, but it was a sight! o Any recommended ones? We don’t use one, and don’t think it is necessary for your Airstream trailer. Occasionally we’ll find a park, like Yellowstone NPS, with high (80 psi?) water pressure. We tried with, and without, a pressure regulator to protect the hose. Just don’t need to worry with today’s high quality braided white water hoses. We generally find the water pressure is lower than we want in our trailer. In some parks the water pressure is so poor our in-trailer showers were awful. Solution? You can, as long as you have water in your potable tank, run your pump during the shower. Gives great pressure. Even better, though, is to replace your RV’s shower head with an Oxygenics BodySpa hand held unit. We did this and it is among our top ten improvements. No matter the water pressure, we get a nice spray anytime, yet still we’re conserving water. This is especially great when we’re boondocking. You can probably find someone who will attest we are completely off base on this regulator issue, as well as the voltage regulation issue. Every group of five RVers seems to have one who has had every imaginable disaster — what we used to call “snake-bit”. We’ve met a couple such folks at the Airstream factory in Jackson Center, Ohio. Of course, this is the place you’ll meet people having problems with their Airstream, right? switch to another brand. Reminds us of the lemon cars or haunted houses we’ve luckily avoided so far. We wish them all the luck, and we are very happy we’ve been so fortunate. o Or criteria to look for in one? Just don’t worry about adding the water pressure unless you know you’re constantly going to be in very high (greater than 80 psi) potable water pressure situations. CAVEAT: We are speaking from our first-hand experience with approx 1,000 nights between this Airstream (2005 CCD 25) and our previous 2005 Airstream (CCD 22). And we get a little help and a few fun anecdotes from some of the many friends we’ve camped with. Future attractions: Comparing solar power to portable generator for RVing, and how do the dreamstreamrs maintain their fresh (potable) water tank throughout the year? Come back and see us, we’re enjoying your comments and feedback. What are our favorite home improvements? We’ve said it before, we’re not afraid to alter our RV, an Airstream travel trailer. We bought it expressly for full timing and expected to modify it. The size is great, the look is great, no complaints on either of those accounts. But we believe we can improve various features to better suit us. As you may know, if you’ve read our website or read along with us for any time, we’ve made a lot of changes. Not all our changes have been big things, and most of them have been inexpensive. We think they have all made our rolling home better for us. You can see the lists here so we’ll only list the top contenders. Our favorite home improvements? It’s not a fancy list by any means. These might not suit you at all but they are our favorites. Many of them were recommended to us by others. There are more than twenty-something changes we’ve made to the interior or exterior of our space ship. In no particular order, here are the best 10 because we can’t pick just one. 1. roof vent cover, MaxxAir FAN MATE – MODEL 900®. This allows us to leave our roof vent fan open irrespective of the weather. The Fantastic Fan rain sensor automatic mode would open and close repeatedly only after we had fallen asleep. We (Jim, really) had twice left a roof vent fan open, with automatic closing overridden. Twice we returned from errands and found rain water on our bed. One of these times the bed was so wet we slept on the sofa until the bed could dry overnight. The Fan Mate 900® allows the vent to stay open even when the rain is pouring down. We only close the vent when it is very cold and if we don’t need venting for gas burning appliances. 2. cutlery drawer and knife drawer, hand crafted by Jim. Our RV’s maker failed to take advantage of a space beside the sink under the kitchen counter. Jim divided the false panel in front of the sink, added drawer pulls, installed drawer glides and a drawer box. This drawer is much handier than the lower three drawers hidden by the cabinet door. Also Jim added a slide-out knife rack on a board supported by breadboard slides. Our knives don’t bang around, stay sharper, always present handle-first, and are out of the way but easy to access. This fits behind the cabinet door below the new drawer and above the factory’s three drawers. 3. shower head, Oxygenics BodySpa®. This shower head makes a vigorous water spray without much water pressure, and has adjustable flow. It is a vast improvement over the original hand-held shower head provided in the RV. Also it is very easy to grasp by the web designed into the handle. 4. solar panels Sharp 125w, and 6v batteries Interstate 2200. This was one of our first customizations, and the one we use the most. It is at work anytime the sun is out. We especially get great use from it when we are dry camping, providing our power needs. And it’s so darned quiet! 5. catalytic heater, Olympian Wave 6®, propane. We stay warm in cold weather without using any battery power. We tried this heater on the floor with Olympian’s accessory stand. The stand’s feet were in the way on our meager floor space. We designed a hinged mount on the cabinet wall between the kitchen and our entrance door. The heater can radiate toward the sofa, the dinette, or the kitchen and bedroom area. Sort of like our own little fireplace – cozy! 6. mattress, 10″ solid latex foam, custom cut (2 round corners). Our factory-installed mattress was almost worthless, and died at a surprisingly young age. We traced the shape of the two radiused corners for our local mattress maker. He, in almost four weeks, provided us a heavy but excellent mattress for our rolling home. 7. Intellipower® charger/converter, 9260 Progressive Dynamics. Airstream had already replaced our Parallax charger converter, a single-stage model. Matt and Beth told me which model to buy. Installation was greatly aided by some of the examples from Best Converter website. Best part has been knowing the batteries are being precisely babied by our new charger. 8. streetside and rear awnings, ZipDee®, from Airstream Service. The Airstream looks really cool with awnings out on four sides. Our refrigerator appreciates the shade from the streetside awning, helps cool the fridge on sunny days. Rear awning is less useful but helps block bright streetlights or moonlight when we’re sleeping. And we appreciate the ability to open streetside windows whether or not it’s raining. 9. oceanAir® shades, all seven windows, from Airstream Parts. Another early improvement, necessitated by the crummy RV shades provided by the manufacturer. Original vinyl roller shades worked okay, just looked poor. These aluminum cassette hatch shades look very sharp open or closed. Airstream realized how good they look too — they later made these standard equipment on some models. 10. washroom door lock, Omni MR-02-102-24 from Perlane Sales. This is one of the handiest improvements we’ve made. Formerly we constantly were hooking a pocket or belt loop on the door lever as we exited the washroom. No longer! This flush latchset is a dream. Easy to install (but you must cut approx 2″ X 3″ chunk out of your door), looks great and works beautifully. This is another one Airstream has made standard equipment on some models. Very nice change, this replacement door latchset. It has been fun to think back on all the changes and consider which have been the best for us. Truthfully, we enjoy every last one of them. You can pick your favorite one. We haven’t been able to pick just one. Some of our improvements didn’t make the cut for “top ten”. We would do every one of them again, they have all worked out as well or better than we expected. > Aluminum 30# propane cylinders — they just don’t rust! We think this about sums up the changes we’ve made. If you want more information about any of these just let us know and we’ll do what we can to help you. Happy Trails! What’s a dual-fuel refrigerator worth? If you could purchase a propane-only refrigerator and save $200 or $300 off the price of a dual-fuel one, would it be worth it? Or, if your refrigerator stops working on electrical power but still works great on propane, what’s it worth to make the refrigerator work on both fuels again? We assumed the cost was worthwhile to restore our fridge to work on either but, after careful analysis, we’re not so sure. It depends upon whether you pay for electrical energy (not everyone does), your energy costs (propane and electricity), and your cost to buy or repair the dual-fuel capability. We replaced, finally, the refrigerator’s power control board last month. Our fridge operated only on propane for four months, August through November. It wasn’t too much a problem since it still worked so well but we felt it should work the way it was designed, on either fuel. And, we were waiting for the other shoe to drop and we might lose use of the refrigerator completely. Also we so often get our electric included in site rental costs, we thought we could benefit from selecting between gas and electric. What’s more expensive, operating an appliance designed for propane on propane only, or paying for the electric heater to operate the gas cycle in your refrigerator? We’ll get back to this. The refrigerator worked fabulously on propane. At $120 for a control board we might save enough propane by using free electric (where we get it) to pay the control board cost. 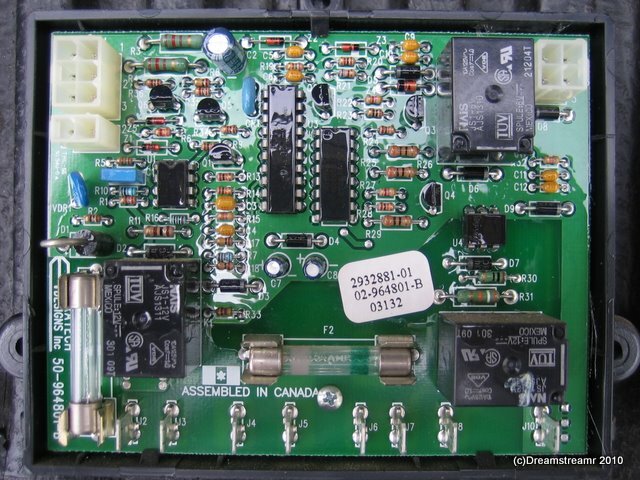 Oh, but we paid $75 in Balzac, Alberta at Bucars RV to have them tell us there is nothing wrong with our refrigerator and we paid another $75 to have Camping World in Boise, Idaho tell us we needed this control board. We knew one repair service was wrong, and thought the other was right. We’d already sunk $150 in diagnostic charges, and figured we might as well buy the board too. How long will it take to save $270 worth of propane? 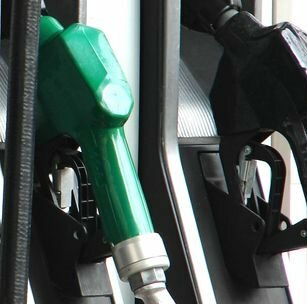 This sounds a lot like the gas – diesel comparison we used to discuss. Funny, we haven’t heard people talking about this as much in the past year or so. Do you suppose it’s because diesel price just won’t come down and stay down below regular gasoline price? And you pay a lot more for the diesel powerplant and drivetrain (and might mind the noise and smell of Detroit diesels in your campsite). Then there’s the maintenance costs. Diesel only pays if you must have the torque. I’ll try not to talk about this later. Back to the subject, if you could choose to have a propane-only refrigerator versus paying an additional $300 to obtain a dual fuel propane/electric refrigerator, are you sure the latter is worth the extra dough? I decided to work on this the way we did at work years ago. And, after working on the calculations all evening, I could probably have come to this answer in the first place. The answer is, it depends. The most important variable is whether you pay for electrical energy (not everyone does), or for what percentage of your RVing months you pay for electrical use. The relative energy costs (propane and electricity) matter greatly, if you pay for electrical some or all of the year. Finally, what is your cost to buy or repair the dual-fuel capability? If your electrical supply is included the price the campgrounds charge you for a site, then your refrigerator will run at no cost to you whenever your trailer is plugged into campground power (Psst — don’t tell your friends whose house you courtesy park at about this, okay?). If your electrical supply is metered, as ours sometimes is, then you won’t see such high savings from electrical power for your refrigerator. The next most important variable is the cost of the two energy inputs, propane and electricity. Small changes can have large impacts, if you are paying for all your electrical usage. For example, if electricity costs you 12 cents per kwh (Florida’s average residential rate for 2009) and the current local price for propane is $3.85, electricity is much cheaper to run. At these prices, we could save a modest $17 per year by paying for electricity instead of propane for the refrigerator. The December 2009 prices in Mesa, Arizona, would save us $32 per year burning propane instead of paying for electricity for the refrigerator. The picture changes completely if electrical service is provided, at no extra charge, with your campsite. Every time you run the refrigerator on free electricity, you save money, and your savings might be $120 per year if you use your refrigerator year around like we do. That’s worth it, for sure! Propane is very rarely free to RVers. But electricity is provided, in many campgrounds, at no added cost. A dual-fuel refrigerator saves money whenever the electricity is provided at no additional cost. But if you are paying for your electrical service and for your propane, it might be worthwhile to compare the relative costs and burn the better priced energy. Is a dual fuel refrigerator worth a few hundred extra bucks (for first cost or cost to restore capability)? The short answer is, it depends. We’re glad we fixed our refrigerator to run either propane or electricity. And, going forward, we’ll pay more attention to the local energy rates before we decide which fuel to use for the refrigerator. It may be worth watching the local energy prices, if you want to control your costs. We often marvel, as we sit cozily in our not so big house, how comfortable and complete our 25′ Airstream trailer is. The compact design is complete with almost every feature we could want inside. Last night we were musing about improvements we could make to our house. This is really easy to do — we can see the entire interior from any vantage point within. 9. more battery capacity would improve our RV’s liveability. 1. Would you like a larger refrigerator than the supplied 6 cubic foot one? This refrigerator has been sufficiently large for over two years. If and when it fails we could opt for the 7 cf replacement Dometic refrigerator — it fits in exactly the same space. Don’t know, we might be able to tell a difference. We sure wouldn’t get rid of a perfectly good fridge to increase capacity by only 16 percent. 2. A lot of people we talk to say they just couldn’t survive with a corner bed. It’s all we’ve had in our two Airstream Internationals (Our Argosy had a pair of twins, but we never slept in it). Their concerns are very justifiable — your partner knows if you try to get out of bed from the wall side, and there is no making the bed without climbing onto and all about it. While this may be tough for some people, we love it. A corner bed makes great use of the limited space we have in our RV’s 8′ X 23′ interior. A walk-around bed would be nice but we’re not willing to sacrifice what little floor space or closets we have to gain it. 3. We’re fortunate and grateful our friends invite us to their larger RVs or park models to play cards. It’s nice to get together as three couples for card games or board games. And we just cannot do this in our Airstream trailer. We might gain enough table and chairs space if we removed our L-sofa and a dinette bench. We love the sofa and appreciate the storage under it, too. We’ve told friends we have room for drinks for six, dinner for four, and sleeping for two. Unfortunately, this Airstream isn’t going to have three couples playing at one table. 4. Airstream trailers (and not all, but many other brands, too) have only two inches insulation in the walls and ceiling. We can tell distinctly we are lacking more insulation several times a year, notably in very hot and very cool climates. More insulation would increase our comfort in very warm climates and would reduce our heating energy during cool spells. While we don’t suffer indoor condensation problems others complain about, better insulation all-around would be nice but this isn’t an improvement we’ll see on this travel trailer. 5. The 2005 Airstream 25, apparently in both the Classic and the International, has a bit of a high toilet seat. Short people need not apply — they might be jumping up and back down and it just doesn’t seem safe. Jim is 5’10” and his feet don’t rest on the floor sitting on this toilet. This feature seems an engineering goof by the designers. We can remedy this one without too much ado by adding a small section of raised floor. We’ll have to be careful where we draw the line for the 2″ raised floor. It would be pretty ugly to stub your toe and fall headlong into the shower. 6. A gravity floor vent would allow us to make up the needed combustion air for our oven, stove, or catalytic heater. A floor vent would be guarded from inclement weather. A floor vent would reduce drafts from opening windows. And, it would provide the needed make-up air very close to the combustion. Wally Byam apparently thought it was a good idea for his own trailers but, for some reason, didn’t get them into the production units. We can do this and may at some point. 7. Our RV’s bed mattress failed after a year of full-timing. We replaced it with a wonderful solid latex rubber mattress, a lot more supportive and, unfortunately, a lot heavier. The manufacturer’s sofa cushions seem to be similarly poor for the purpose. Since the sofa lacks any innersprings and the cushions sit on plywood forms, we need higher density foam cushions. Several of you have reported your success in doing this and we’re looking forward to this improvement. 8. We boondock somewhat regularly in the summer and fall when we enjoy visiting state and national parks. Some of these parks allow camper savings by opting out of utilities and others just don’t have the utilities. Either way, we benefit by using as little battery-powered stuff as we can. We have LED lighting in the washroom, our wardrobes, and on the porch light. We will, this year, install an eighteen inch LED strip over the kitchen sink and counter. We may find other applications as well to extend our battery power when off grid. 9. Almost two years ago we replaced our two group 24 12v marine/rv batteries with a pair of Interstate 6v 2200s, golf cart batteries wired in series for 12vdc. We gained more battery capacity and might be at a good match with our two 120 watt solar panels. Last fall, while boondocking at the Sun Valley Jazz Festival, we enjoyed great sunshine most days. And we really only had enough battery for one day at a time. It seems we could, with another pair of 6v golf cart batteries, gain all the battery capacity we could want for nights and weekends. This may be something we can easily accomplish. These potential changes aren’t, any of them, must haves. Some aren’t feasible at all in this RV. But these are the biggest things we can imagine would improve this almost ideal space. Some of these changes are included in other, larger, RVs. All these options are available by some means in many RVs. If we find ourselves in the market for another RV we would include these as important criteria. You can probably think of more important changes you would want. We’d love to hear what you think — let us know? We’ll talk about our favorite improvements we’ve made to our travel trailer in our next post.